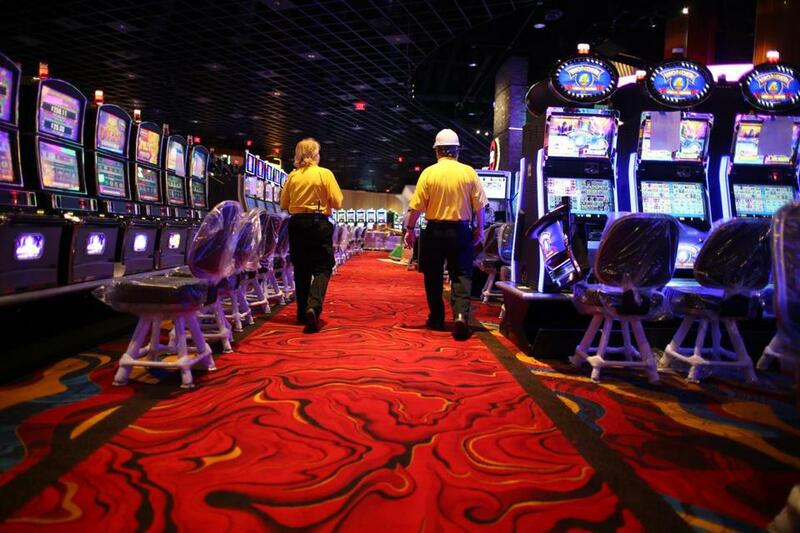 PLAINVILLE — Gleaming glass and steel doors will slide open onto Massachusetts’ first casino floor this week, revealing a shining sea of high-tech slot machines, a sleek sports bar named for a football hero — and a glimpse of the future, for better or worse. 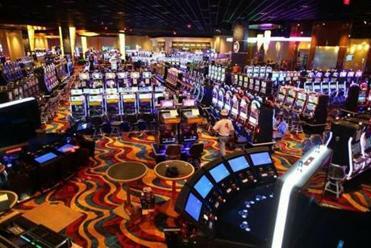 Plainridge Park Casino’s public opening Wednesday afternoon follows decades of deliberation and makes Massachusetts, known for its progressive present and Puritan past, the 40th state to take a chance on casino-style gambling. Whether the state’s late bid can persuade gamblers to cancel their trips to Rhode Island and Connecticut, and instead sink their quarters into their home-state coffers, will help determine whether the Legislature’s grand gamble will pay off. The first of three gambling emporiums planned under a 2011 state law, Plainridge bears some distinctly Massachusetts markings. Unlike its regional competitors, it’s smoke free and no one under age 21 can gamble inside. Unlike a few states that allow alcohol service around the clock, last call at Plainridge is 1 a.m.
And the allure of the beckoning slot machines — branded with everything from scantily clad cartoon characters to daytime talker Ellen DeGeneres — will be accompanied by some of the strictest regulations in the country aimed at reducing compulsive gambling. 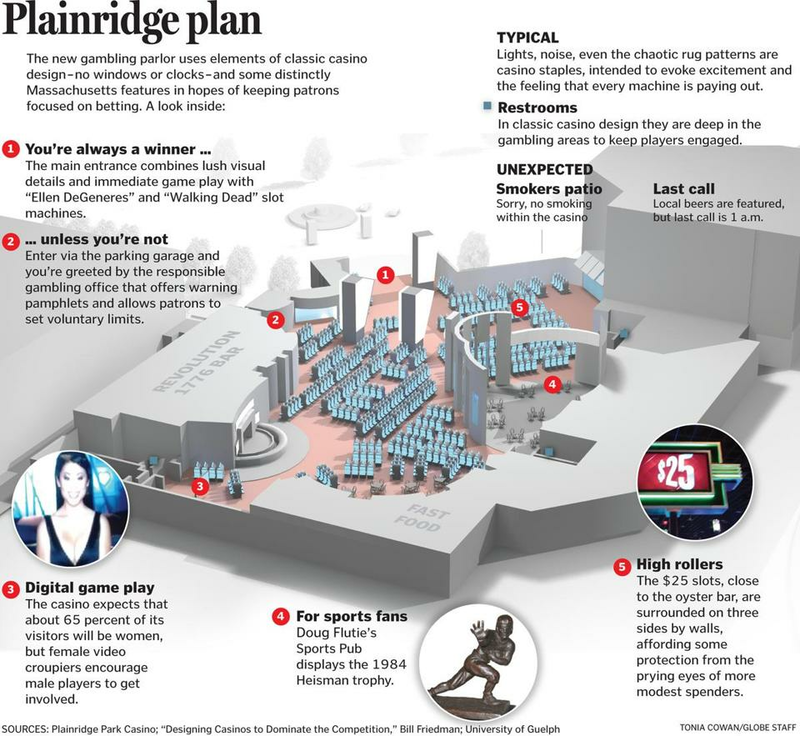 The Plainridge casino, with its 1,250 slot machines, is projected to generate $250 million in annual gaming revenue. Those measures could keep some players away, but Plainridge is playing for high stakes. The casino aims to make nearly twice as much money on each of its 1,500 slot and video blackjack machines as its Connecticut competitors, Foxwoods and Mohegan Sun — directing as much as $250 million in revenue to the state in its first two years. Most of that money is pledged to cities and towns, for such expenses as police, firefighter, and teacher salaries, while tens of millions of dollars will come off the top to support the horse racing industry. Plainridge was built to keep gamblers closer to home. Roughly half the gamblers at Twin River Casino, only 20 minutes away over the border in Rhode Island, come from Massachusetts, and one-third of the cars in the parking lots of the two resort casinos in Connecticut are from the Bay State as well. The nonsmoking casino in Plainville includes 1,500 slot and video blackjack machines. Still, industry watchers wonder whether the shiny new slot parlor in the state’s southeastern woods — about 35 miles southwest of Boston and 18 miles north of Providence — can rake in enough money to thrive under a tax burden substantially higher than in Las Vegas and among competitors offering true Vegas-style table games nearby. To lure customers, Plainridge has installed the most technologically advanced slot machines in a high-ceilinged hall appointed more like a big-time Vegas casino than a stereotypical smoke-filled slot parlor. Gone are the buckets of quarters and stacks of chips, replaced by touchscreens and the magnetic stripes on player loyalty cards that offer free play to first-time visitors. Few of the splashy new slots carry the old-time levers gamblers once used to test their luck. Instead of blackjack dealers turning cards and taking tips — table games weren’t permitted at Plainridge under the state agreement — doe-eyed digital women in low-cut tops smile from the screens of computerized multiplayer card tables. The roulette machine spits a real ball into a spinning enclosed chamber, and an invisible hand rakes away the virtual chips. Plainridge officials say they hope to collect almost $500 a day on each slot machine within 12 months of opening. Others aren’t betting on it. 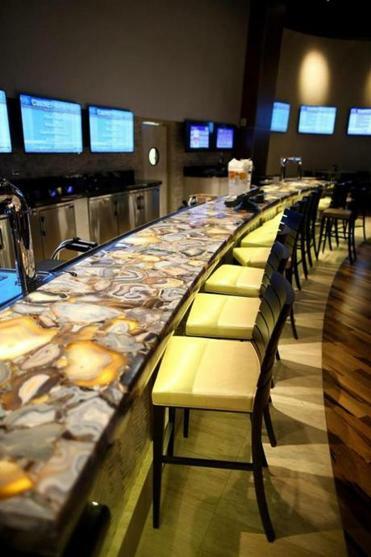 Plainridge Park Casino will feature a Doug Flutie sports pub (pictured). To meet its goals, Plainridge is heavily promoting its loyalty rewards card, which allows gamblers to earn points for drinks, meals, or free play at its machines. “It’s a way to hook people in,” she said. At a kiosk tucked away near the parking garage elevators, live advisers will be available 16 hours a day to counsel problem gamblers who come asking for help, the first program of its kind in the country. Plainridge will maintain a list of gamblers who decide to exclude themselves from the casino, whether for six months or forever. And by September, the casino will have in place a system that will allow gamblers to set a limit on their spending on any session, and to get an electronic reminder when they have hit that limit, another first in the country. Plainridge’s premiere on Wednesday marks the culmination of 25 years of political debate, triggered by the opening in the early 1990s of two wildly successful casinos that lured Bay State gamblers across the Connecticut border. The Legislature wrestled with expanding gambling for years, but casino bills were routinely thwarted — first by socially conservative leaders and then because of a philosophical dispute between House Speaker Robert DeLeo and Governor Deval Patrick. Patrick called for building three high-end gambling palaces with all the trappings of those in Las Vegas. DeLeo, intent on saving the state’s fading racing industry, insisted on including a license for a slot parlor that the race tracks could seek to win. Patrick ultimately signed legislation in November 2011, but even then — as the regulatory process dragged on — casino gambling seemed threatened in Massachusetts as recently as last year, when opponents succeeded in getting a repeal question on the ballot. In the end, that failed by a large margin, paving the way for the resort casinos Patrick envisioned to open in Springfield and Everett in the coming years. Plainridge was the price Patrick paid. But the state’s first gambling complex — technically a slot parlor — looks little like the grim gambling barns that term evokes. It features an upscale restaurant and a Doug Flutie sports pub where Flutie’s 1984 Heisman trophy will glitter behind a glass case. “We are different from what most people think of as a slot parlor,” said George, and the place markets itself that way right down to its name: Plainridge Park Casino. Sean P. Murphy can be reached at smurphy@globe.com. Follow him on Twitter @spmurphyboston. Nestor Ramos can be reached at nestor.ramos@globe.com. Follow him on Twitter @NestorARamos.